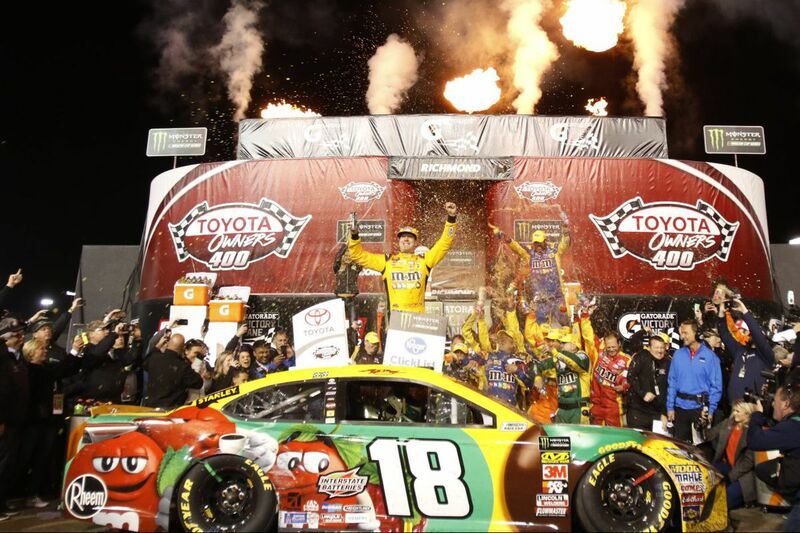 Kyle Busch, center, celebrates in Victory Lane after winning the NASCAR Cup Series auto race at Richmond Raceway in Richmond, Va., Saturday, April 21, 2018. It's no secret that Kyle Busch generates reactions in NASCAR. The 32-year-old superstar driver is similar to what controversial Sixers Hall of Famer Allen Iverson used to say about himself – a million people loved him and a million people hated him. Busch is one of the most polarizing drivers on the circuit, and the man whose nickname is "Rowdy," says he is fine with that. "I think it's a good thing when you're a polarizing guy and people are paying attention to you whether it's good or bad," said Busch, who began his path to NASCAR by driving a go-kart around the cul-de-sac of his family's home in Las Vegas when he was 6 years old. "I think it is obviously a better thing for you. "Whether I'm liked or disliked for my success, that's not my problem. I just out there and do what I can and control what I can control." Busch comes into Sunday's AAA 400 Drive for Autism at Dover International Speedway riding the hottest streak of his career. Last week, Busch had his three-race winning streak snapped when he finished 13th in the Geico 500 at Talladega (Ala.) Superspeedway. It was just the third time Busch did not finish in the top five in 10 Monster Energy Cup Series races. When Busch won the Cup Series title in 2014, he also had a three-race winning streak. "It's not easy to come by, that's for sure," Busch said of a winning streak. "There's a lot of hard work, a lot of dedication and a lot of circumstances kind of have to go your way. Really at every race, the goal is to make it through unscathed and have a good day." For people less familiar with NASCAR, it could be easy to believe that the driver with the best car should win the most races. Busch said it's never that simple. At this level of competition, there is so much money, research and development dedicated to building cars, any advantage of technology will be slight and it never lasts long. Early in this season, the Ford cars seem to have the edge, but Busch in his Toyota has been on the podium as much as anyone. He has three wins, the same number as Kevin Harvick, who drives a Ford. "We've not been the dominant car in maybe any of these races, but we've certainly had our fair share of good fortune go our way to get where we are at this point," Busch said. "Most people, including the commentators, are saying the Harvick team seems to have the strongest cars right now, so it seems as though we're beating them with a little … inferior equipment, let's call it. "We're not slouches by any means and we're doing what we need to do to take the checkered flags home." If Busch appears to have taken a subtle dig at Harvick while complimenting his own team, it would not be surprising. Given the aggressive racing styles, success and quick fuses both have, a rivalry was almost a given. Busch's career is littered with disputes with other drivers — some which have led to fines and probation. Punches have been thrown. Still, with 46 career wins and 249 top-10 finishes, no credible argument can be made against Busch and his level of success on the Cup circuit. "I think some people want to be the more liked guy," Busch said, " but in my regard, I'd rather be the most successful guy."